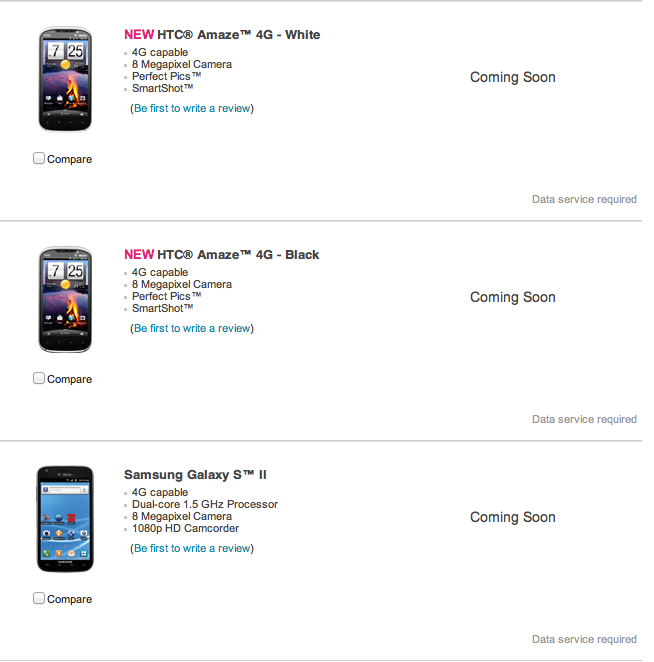 T-Mobile has the HTC Amaze 4G and Samsung Galaxy S II up on their website as coming soon. Of course these have been up for a while but quite a few of you are sending this in so we thought we’d just make everyone aware. Of course we know by “coming soon” they mean pre-order on October 10th but this serves as another reminder that your piggy banks should be ready to crack open in four days. There isn’t much to learn from either of these listings but if you are looking for a reason to check T-Mobile’s website and see some pretty press images of both smartphones then check them out are their respective links below. I will take option D as in none of the above. Nexus Prime, please. What about it being the first Ice Cream Sandwich device? A pure Google experience without any obstructions? Do you have a link that states no Nexus Prime? You sure know a lot about this device. Do you work for google or Samsung. You can’t make statement’s like that without any proof. I believe the device will be exclusive for a short period of time but that’s about it. This is a google device and knowing them, they want it on as many carriers as possible. Also, I doubt that the HD display is the only impressive thing about this phone. We will know everything very soon. Sorry for being lazy, but anyone have a link to a good head to head comparison of these two phones? Supposedly Oct 12 as told by rep.
what are chances of GS II getting BOGO deal like GS I??? GALAXYS2 FREE ON HOLIDAY BLACKFRIDAY WITH NEW LINE? Hold on a sec, does that mean that the date has been pushed back? No, what gave you that idea? Because of the coming soon. Why not just say oct 12? It’s been there for days, you guys just noticed that? HAHA I thought the same thing when I read the “new” headline. Hey guys, this IS a T-Mobile supporting site, right? Well I just noticed it, I apologize if I didn’t notice it before. If you noticed it was up and not on the blog, please send me an email so I can let everyone else know. Why? It is not our responsibility to keep you informed DAVID!!! This is your site thus it is your responsibility to keep it updated otherwise if you want that information you can hire me or someone else to do the searching for you. Hey!! We are in a recession…..time is money!!! T-Mobile for the win!!! MrTechy, I hope you recognize the reality that I am only one person and I can’t see everything and be everywhere. You see the submit news link on tech blogs? How do you think we learn about news? Because readers like yourself tip us off. Very simple. I don’t know why people are saying that Nexus Prime with be out on T-Mobile? It’s a pure Google Phone, same as previous two Nexus Phones, which came out on all carriers. This phone will be out without any company logo. And probably will be also sold straight from Google itself as unlocked version, I know previous Nexus was being sold at Best Buy stores. When people say it will be on T-mobile, it doesn’t matter who actually sells it (Nexus One – Google, Nexus S – Best Buy), the point is it is specifically made for T-mobile’s network. Just sold my Mytouch on ebay!!!!! Just sold me myTouch 4G slide on ebay too!!!!! I’m not waiting for the tooth fairy. Getting the Galaxy 2s when it comes out. Actually, the reports are that the body will be metal. T-mobile doesn’t sell the Nexus line. It will be available in T-mo bands at Best Buy and probably Amazon. I personally hate HTC Sense. It makes no sense to me. going back to Samsung, and getting the GS2 on day 1. Wow… just on the news, Jobs passed. It is somewhat surreal that with the announceme­nt of the iPhone 4S, that was perceived as a negative by the media and public, that the next day Steve Jobs passes. Obviously Apple timed the 4S release with Steve’s imminent passing. I have to wonder if Steve Jobs wanted it this way, to NOT announce the iPhone 5 when that debut would be clouded by his passing. Jobs was that way, I suspect he told Apple to wait on announcing the iPhone 5 until a few months after he was gone, so the media could focus on the phone rather than his death. It would be just like him to do that since he always put Apple first. Samsung T989 Hero Diamond. , in white and titanium….. David ? Which one of these phones are you getting? I’m torn I want a bigger screen but I do like my cliq 2 keyboard. One of these or the slide4g. I was on the phone with an account something or other person complaining about my HD2 overheating and what not when I managed to finally hear a confirmed date for the GS II. 10-12-11. You may all already know that of course. They still don’t have pricing info though. Chelsea: I’m more than happy to assist you. Can I ask for your name please? Chelsea: Thank you Franklin! Are you an existing t-mobile customer? You: so that means it can work with att 3g right? Chelsea: Thank you for the information! Currently, we do not yet have a time frame for Samsung Galaxy SII to be released. Once available it will be listed online and will be available for you to purchase. Chelsea: I apologize for that. But we do not have this information. As we are from the sales support team. Please contact our Customer Service Center at 1-877-453-1304 or dial 611 from your cell phone for assistance with this. You: ok i understand that but am just asking you it will support att 3g because am looking at the specs on tmobile.com and it has att 3g frequency too. Chelsea: Yes, you are correct. It has 3G frequency. Chelsea: I haven’t heard from you for a while. Do you need further assistance? You: so that means it will support att 3g right? because i remeber with the Lg2gx came out tmobile.com said the same thing then later said it doesn’t support it. Chelsea: Yes, it will support AT&T 3G.